I just HAD to share that huge grin! Georgie has been showing an interest in his potty for ages. We had no plans to start him potty training just yet because he's only 2 1/4, but if he's keen we're not about to stop him either. He has been fighting nappies for ages, much preferring the "pull up pants" that Tom wears for bed. Sometimes we oblige him, sometimes we don't. Mainly because they are much more expensive than his nappies... 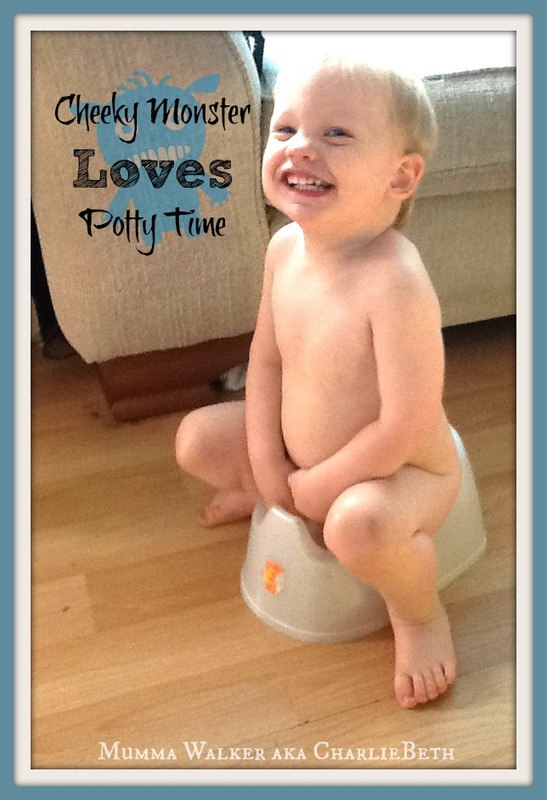 But if he really wants to use them and try to use his potty more I guess we should go with the flow! This evening Hubby was changing Georgie's nappy and George was fighting him as usual. He got up and wondered off asking for the potty. We've had it out for a while because he likes to play at using it, but we've not put any pressure on him. So I showed him where it was and off he toddled. He sat down, as he often does, and we thought nothing of it. Only this time when he got up, he DIDN'T wave it around like he normally does. Just stood there, pointing, and saying "Look Mummy!" and sure enough.... there was a wee! So we made a fuss of him, gave him a chocolate coin, and he grinned from ear to ear! We're still not putting any pressure on, and he's still in nappies for a while - nursery tomorrow and on Thu Hubby will be home alone all day with ALL THREE BOYS thanks to the Teacher's Strike - but I'm thinking on Friday I might let him wonder about without any nappy or pants on and see how he gets on. Take it nice and slow. It's over a year before we really need him to be out of nappies and pull ups for Big Nursery, and with a new baby imminent I am aware that now it not the best time to start a major routine change. But it would be foolish to stop him from trying if he really wants to!